During the following open enrollment periods, completed applications for applicants under age 19. The completion of the standard health questionnaire will not be required during this time. Enrollment materials are due by the 20th of the month, or the first business day following when the 20th falls on a weekend or holiday. Applicants may request an effective date up to 90 days in advance of when they sign their application. Applications received from applicants under age 19 after an open enrollment period ends will be denied enrollment unless they meet qualifying event criteria to enroll for a special enrollment period. The special enrollment period must continue for a period of at least 31 days from the date of a qualifying event. Subscriber or dependent loses employer-sponsored insurance. Supporting documentation required: a copy of letter that indicates they lost their health plan coverage, or COBRA offer letter. Subscriber or dependent loses eligibility under Medicaid or other public program providing health benefits. Supporting documentation required: copy of termination letter. Subscriber or dependent loses coverage as the result of dissolution of marriage. Supporting documentation required: copy of divorce decree and copy of letter that indicates they lost their health plan coverage, or COBRA offer letter. Subscriber or dependent changes residence, and the health plan under which they were covered does not provide coverage in that service area. Supporting documentation required: include a copy of a utility bill in name of the applicant or guarantor from the previous address dated within the last 31 days and a letter of verification from their prior carrier verifying that because they have moved, they no longer reside in their service area and they cannot provide health insurance at their new location. Subscriber or dependent is being added as the result of being a newborn, recently placed for adoption or having been adopted within sixty days of the application date. The sixty day time period applies only to this qualifying event. Supporting documentation required for newly adopted children only: court documents that indicate the date the child was placed. In an effort to streamline and improve the Medicaid program in Washington State, a new program called Washington Apple Health will allow more people to get better health care. Will you qualify for Washington Apple Health? If your income is below the following, you may be eligible for the new Medicaid program. 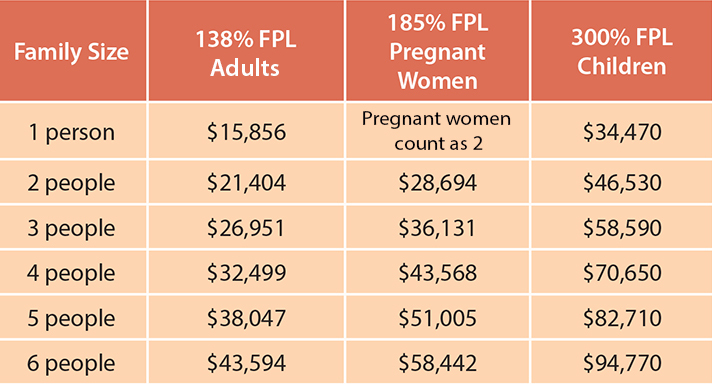 FPL means "Federal Poverty Level." These numbers are estimates and may change. For more information about this program, including how to enroll, please visit the Health Care Authority website. Current Medicaid members under the Healthy Options or Children's Health Insurance Program will eventually be enrolled into the Washington Apple Health program. For more information about those programs, please click on the links below.